My last ride of this decade was fantastic. Two inches of fresh powdery snow had already fallen by the time I got to the Upper Dodgingtown lot at Huntington State Park in Bethel. Met up with some friends from CT NEMBA and off we went. 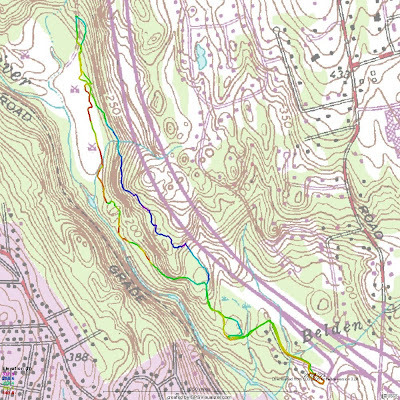 The combination of all the rain and then frigid temps earlier this week created some really tricky spots while riding down the closed section of Old Dodgingtown Road toward the Big Burn but once in the Singletrack all those fears melted away. Six people started out, Paula (not pictured), and from left to right: Heather, Brendan, Glenn, and Dexter. I posted the ride on the CT forum for NEMBA at the last minute to see if any other members wanted to join and that's how Dexter found out about it. There was another single speed, rigid, 29er on this ride, a redline D440 ridden by Glenn (in orange). Everyone else were riding full suspension bikes. Here and there traction was sketchy but I was able to climb just about everything, there were a few times, however, where lower gears would have been nicer. I was riding the Dillinger in order to break 100 trail miles on it on this ride and that was accomplished. The new tires are really grippy, especially in the snow. I know I look a little chubby in the picture below but that's because I had a extra pair of gloves and my over booties stuff into my jacket. The booties kept coming off because I didn't have them on tight enough and my feet were plenty warm, anyway. At first I was wishing I had brought the lobster gloves because my hands were freezing for the first 5 minutes of the ride but then they warmed up when we got into the single track of the big burn. Here is a little clip of my riding the Dillinger across one of the earthen dams at Huntington. Afterwards I headed up to the Rock and Roll Trail head and then headed south into the woods to start scouting a new trail that I have permission to start marking. 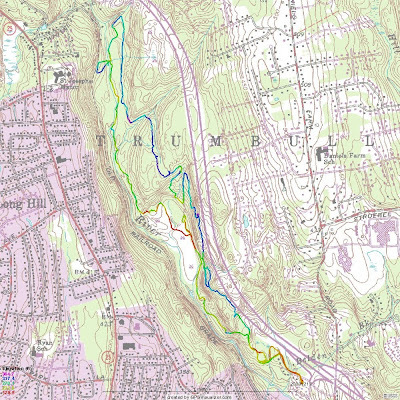 I plan on extending the Rock and Roll to hook up with the South Pond Trail and also connect with single track on the east side of South Pond. 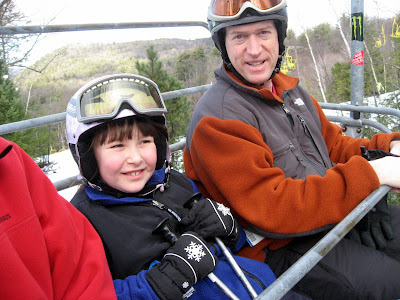 Went back to Ski Sundown today with my wife and daughter. 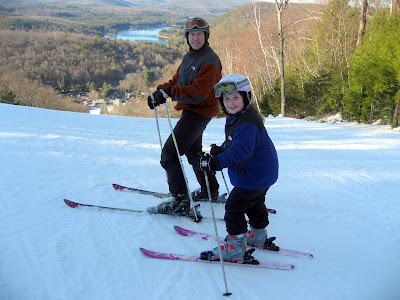 They skied and I snow boarded. Much warmer today. We had a blast. 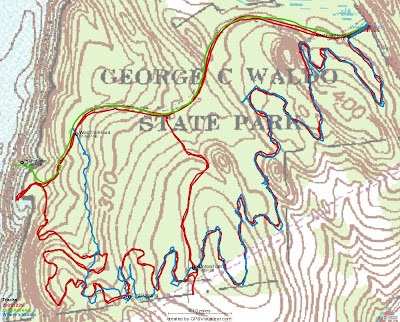 Headed over to George C Waldo State Park because the latest trail report said the Where's Waldo trail was in fabulous shape after the big rain that washed away all the snow we had over Christmas. Midday high on Tuesday was 18 degrees but the wind gusts from 30 to 40 mph made it feel like minus 3 degrees. Naturally, I dressed accordingly and in fact not one part of my body ever got cold. My Blaze Orange, Columbia Wind Stopper fleece jacket is perfect for these conditions and since there could still be hunters out and about the color is perfect. These new lobster gloves did the trick for the hands. They were so warm/hot that my hands were sweating midway through the ride. And for the first time ever I wore neoprene shoe covers that I originally bought for commuting. My feet never got cold. Another reason to ride Waldo is that I haven't ridden it all year and I wanted to see all the work Paula has been putting into this trail. It is amazing the amount of benching she has done. Also, George C Waldo lies across Lake Lillilohna from Upper Paugussett State Forest which means it's pretty close, just a 15 minute drive. I rode down the Where's Waldo Trail and then down to the water's edge. Back up the fire road to the Hunter's trail and then rode the Hunter's trail back to the Waldo where I rode the upper section in reverse. Then I rode back down to the Hunter's trail and did another loop on the bottom section. The blue track in the above map is what I rode last year and where it veers off the red track is where I lost the trail markers when the Waldo trail was still in it's infancy. The lower section (past the Hunter's trail intersection) is a twisty, turny, up and down trail that was a blast riding and that is why I did it twice. With the double loops I was able to a 7 mile ride in just under 2 hours. 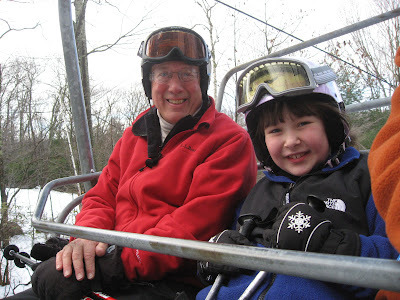 Went skiing with my Father and daughter on Sunday at Sundown in New Hartford. The place was absolutely empty and the conditions were fantastic! It was warm enough to be spring conditions, in winter! Katie and I about go down Gunbarrell. 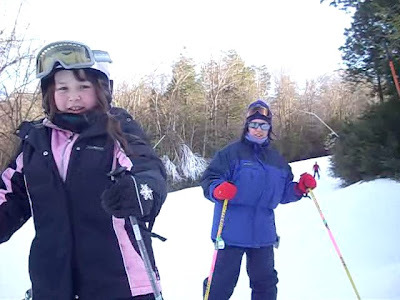 This is her third year skiing and she is already doing black diamonds! Maybe it was the second Growler (Drayman's) on Christmas Day, or was it the grueling workout just riding down the logging road with a hangover but I thought what I saw was a bear looking down at me. Of course bears probably wouldn't be out and about right now but it sure looked like one. I held still for a few minutes and then whipped out the camera and took the picture. However, it seemed too still. Turns out it was just a stump with some dried beech leaves in front of it which made it look like light brown muzzle with a black head behind it. If it was a bear it probably would have took off long before I got to this vantage point, it would have certainly heard my bells. Riding in these conditions were slightly better than my ride at Trumbull earlier this week. The overnight freezing rain and sleet made the previous tracks left by other mountain bikers on Christmas Eve tougher to ride in than just open snow. One thing that was certainly different, I felt, was the new tires. These Serfas Krest 9'er tires are really grippy and felt really nice. Can't wait to see what they are like in drier conditions. Riding in the ATV tracks made it somewhat easier but the ride was still turning into a death march. Initially I thought I might ride up the Gussy and then see where I could go from there but riding up Sandford Rd with a fresh coat of ice, I decided to do the fire road first. On the way in, I ran into Jeff Pritchart who walks in the forest almost every day. He was just coming back out but said he was bush whacking all over the place. The Soul Cycles Dillinger is a fantastic bike and might be one of the best bike purchases made to date. I love the power you get with the aluminum frame and while it can be a little punishing on the body without suspension the ride will only get better when I ad those components, too. Hope everyone has a wonderful holidays and rides as much as possible! A new set of tires for Dillinger, Serfas Krest 9r's. Yes, they are little heavier because they an extra layer of rubber to protect against thorns, which is perfect for me when scouting trails. Can't wait to try them out. 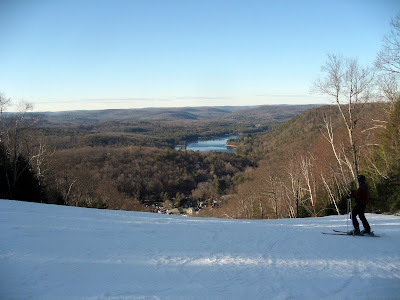 Upper Paugussett is looking fine. Should have ridden there instead of going to Trumbull because it would have virgin powder. What a difference a snow storm makes. Last Saturday when we rode Trumbull is was schweet! Then we get a 8 inches of snow and now it stinks, well sort of. If you are blasting your own track it was pretty good but all the popular trails were already well trodden with snowshoes, other bikes, and plenty of feet. It was no joy. Probably rode half and hiked-a-bike the other. I think having gears would have made it better. Might have the 'Horse back this weekend and I will definitely take it to Upper Paugussett. Up in the ledges section, somebody went big! Saw this downy woodpecker working on a sapling. This woodpecker must have been hungry because he didn't notice me for a good five minutes as I got off a good picture of him and just enjoyed his little show. It's been almost two weeks since I have been on a bike and I thought I was going through withdrawal symptoms. Snow and ice are still blanketing the Upper Gussy Trail and it's been so freaking cold lately that even the thought of an early morning ride gave me the chills. Alas, the weekend! Headed down to Trumbull to scope out some sections of the trails that we are going to re-route in the spring. It was pretty darn cold, though. Must have been in the upper teens or low 20s. Had to wear my polar fleece gloves initially because my hands got just too cold, too quickly with my other gloves. Feet started out warm but once they got sweaty they got cold when all I was doing was pedaling. Granted, not numbingly cold that you would expect with the conditions, just a little uncomfortable. Still, I think for temps below 30 degrees the winning combination is a ski sock and liner sock, although, I might consider my overbooties next time. The route we took was a lot different than what I am used to, at least in the beginning. For some reason I think I tend to stay on the yellow trail on most of my riding in the Ledges section, and I can only think of one other time I have ridden the red trail above the highway was maybe the second time I had ever ridden here. These new Ergons are outstanding! The leverage from those bar-ends is amazing. Reaching out onto to them, with their ergonomic shape feel so natural and my climb is a lot stronger now. I found one section. Even though the greens are off I'll take function over fashion at this point. This kid's toy I found near the Indian Ledges play ground looks like the grip color but is actually closer to the frame color. Now my son has a third Kid Kinects toy foot to play with. I still can't get over how much fun it is to ride this bike. It will be interesting to see what happens when I put a squishy for on Dillinger. I am sure it will smooth the ride out immensely. The other addition I am contemplating, if I can ever find one, is a USX shock post just to take the edge off. Also, situation seat bag has been cleared up. The FSA seat post has a set back which for some reason fits this style of seat bag better than the carbon fiber seat post. I will probably go back to the carbon fiber post for races and use the FSA for everyday riding. At the southern entrance to the Pequonnock River Valley there is this old piece of railroad track that is used like a fence rail. I guess on the other side of the tree it might be wide enough for a vehicle to pass through and thus the necessity to create this type of barrier. The track might be a bit of history in that looking at the size of the rails could be that it either came from the Housatonic Railway line on the other side of the river or maybe it was part of the mine tracks from the Tungsten Mine at Old Mine Park. What's cool is how the tree has grown around it. Here is a picture of Rich. Rich is a dynamo when it comes to trail building. 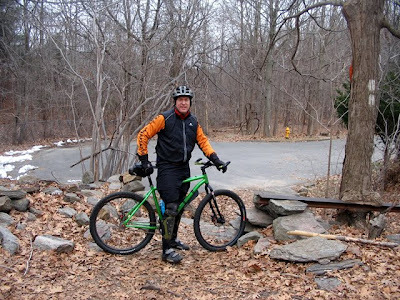 He has helped me out on the Gussy Trail and is one of three people that know of that has done some work at Trumbull recently.